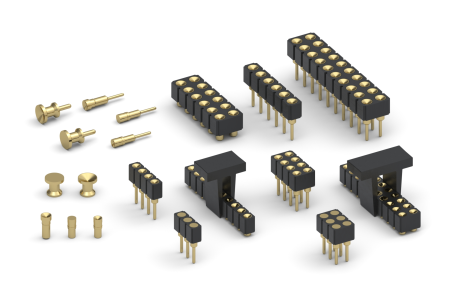 Mill-Max is excited to introduce a selection of new target connectors and pins. These components are used in place of SMT pads on a PCB as the mating surface for spring-loaded pins. The new series’ are offered in .100” (2,54 mm) and 2 mm grid connectors as well as new discrete pins for a wide range of applications. Our new line of 2 mm pitch target connectors are designed to mate with our recently released 836 and 838 series single and double row 2 mm pitch spring-loaded connectors. We are offering both through-hole and SMT terminations with the SMT products packaged on tape and reel. This product family includes choices for connectors with flat or concave face contact surfaces. Concave face targets provide additional surface area for mating and can aid in centering/alignment of components and/or boards fitted with spring-loaded connectors. As a complement to our existing .100” (2,54 mm) grid through-hole and SMT target connectors, we are introducing three new series’ featuring targets with concave faces: single and double row through-hole and double row SMT. Rounding out the lineup of new target components are four discrete target pins well suited for mating with Mill-Max’s larger spring-loaded pins such as the 0861-0 and 0871-0 which have .092” (2,34 mm) diameter plungers. There are two through-hole pins, one with a flat contact surface (1946-0) and one with a concave contact surface (1945-0). These pins are characterized by a large .125” (3,17 mm) diameter face, a .120” (3,05 mm) above board height and a .030” (,76 mm) diameter tail. The SMT pins have the flat contact surface (1944-0) and concave contact surface (1943-0) options along with the .125” (3,17) diameter face and .120” (3,05 mm) above board height. These SMT pins are available in bulk or packaged on tape and reel. All the pins are RoHS compliant precision-machined and gold-plated for environmental protection, durability and good conductivity. The connector insulators are molded from high temperature plastic suitable for most soldering process including RoHS environments.